Polling Hours are from 9am - 3pm on Sunday, May 18th, 2014 at the IMAN Foundation: 3376 Motor Avenue, Los Angeles, CA 90034. Election results will be reviewed and confirmed by the Department of Neighborhood Empowerment. 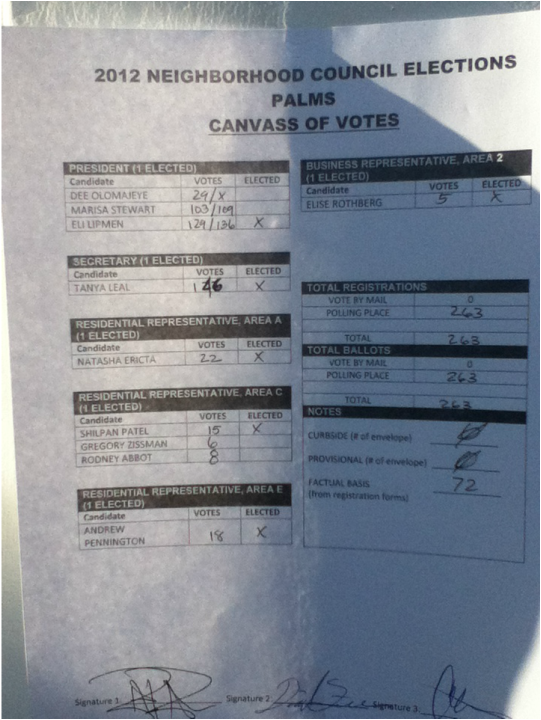 Today Palms voted overwhelmingly for change. Congrats to Palms NC President-elect Eli Lipmen! Thank you Palms! Thank you EmpowerLA team for a great NC election in Palms! The MAIA endorsement Process is a standard political endorsement process. One similar to most political endorsement procedures. While many in Palms are not familiar with endorsements it is part of the political process and part of Palms becoming more professional and sophisticated as a community with adequate representation. Suitable candidates were invited to interview in front of a number of our MAIA members for one hour of questions. Following that process candidates had 24 hours to complete a 25 section questionnaire. Upon appropriate completion of all areas of the process the oral and written information was transmitted to our MAIA committee and an endorsement decision was made. Those endorsed and only those endorsed were put on MAIA materials and web site. While MAIA felt there were other very strong and suitable candidates for PNC office we were only able to list those that completed the process and were then chosen as suitable candidates.